Breast cancer is the most common disease among middle-aged women worldwide. In India, breast cancer is the second most common malignancy after cervical cancer. GLOBOCAN project report (2011–2014) shows that there are 145 incidence rates per 100,000 female population and 70 mortality rates per 100,000 female population in India. The incidence is increasing in most countries at the rate of 1%–2% annually and soon nearly one million women will be suffering from this disease every year throughout the world. Imaging of the breast aims at early diagnosis of breast lesions, differentiation of benign from malignant lesions, and the detection of tiny cancers before they are symptomatic or palpable. X-ray mammography is an important examination widely used for female breast screening and also used in male breast for the examination of symptomatic patients.,, The dose delivered to the breast depends on the X-ray spectrum for target/filter (T/F) combination, breast thickness, X-ray tube current with exposure time in milliampere-second (mAs), and the peak kilo voltage (kVp) values. Even though the mammography unit operates in the low tube voltage range typically about 25–35 kVp when compared to other radiography units, a little variation in its operating parameters can lead to the delivery of higher doses which can be detrimental since the breast is a radiosensitive organ. It is, therefore, necessary to ensure the performance of the machine operating parameters are to specifications and maintained. This work examined eight mammography units from five manufacturers following the American Association of Physicists in Medicine (AAPM) and Atomic Energy Regulatory Board (AERB) protocols which include test for accelerating voltage (kVp), mAs accuracy and its corresponding dose, half-value layer (HVL) measurement, machine output using NOMEX multimeter, compression paddle calibration, image quality check using both mammography accreditation phantom and single exposure high-resolution phantom, leakage radiation measurements, and radiation survey using pressurized ion chamber-based survey meter.,,, In addition, entrance skin air kerma was measured using Metal Oxide Field Effect Transistor (MOSFET) dosimeter and stereotactic needle biopsy phantom in one of the mammography units to analyze the average glandular dose (AGD). The quality assurance (QA) tests were carried out on eight mammography units, of which 7 units have molybdenum (Mo) filter and the unit 1 (Siemens - Mammomat Inspiration) has beryllium (Be) filter. The technical details of the units manufactured by different manufacturers are summarized in [Table 1]. These machines were installed during the past 15 years in various hospitals located in residential as well as commercial areas. The following tests were carried out in all the mammography machines as a part of QA. The tests 1–6 were performed using a solid-state dosimeter-based PTW-NOMEX Multimeter (PTW-FREIBURG, Physikalisch-Technische-Werkstätten, DE-79115, FREIBURG, serial no. T11049). The software, NOMEX multimeter version S030008 was connected through a USB cable to an external computer (laptop) that controls the mode of the radio diagnosis equipment and then data were recorded. In all the measurements, the computed radiography (CR) cassette was placed in the bucky without CR imaging plate and film in order to extend the life time of the CR imaging plate and to avoid the wastage of film respectively. 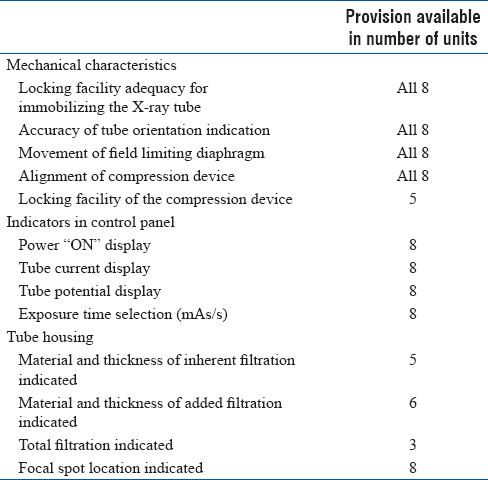 The following mechanical tests such as mechanical characteristics, indicators, and tube housing were carried out in all mammography units as shown in [Table 2]. This study was performed to verify whether the measured kVp matches with the set kVp. In general, X-ray tubes which are designed for film-screen mammography have Mo target, a thin beryllium window, and a Mo filter of about 0.03–0.4 mm thicknesses as given in [Table 1]. These tubes operate in the voltage range of 22–49 kVp and commonly have a rotating anode to achieve tube current in the range of 100–200 mA. The kVp accuracy was evaluated manually for different settings by gradually increasing its value from 25 to 35 kVp at constant mAs and T/F combination at the focus to detector distance (FDD) of 65 cm by placing the NOMEX multimeter on the breast support. Further, the percentage of error was calculated using the equation 1. The results are shown in [Table 3]. Set kVp - Reading noted from X-ray tube control panel. The machine output was measured to understand the performance of the X-ray generator, tube, and filtration which allows one to determine whether the unit can produce images with acceptable short exposure time. 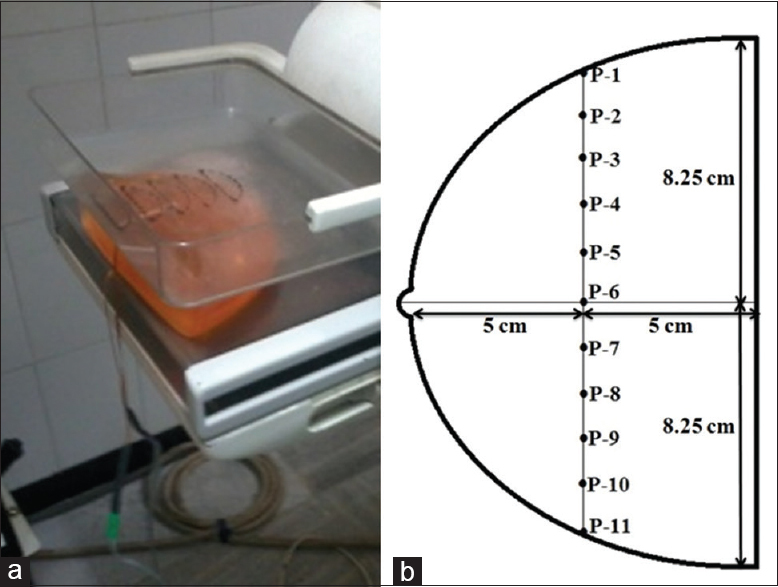 The output was also measured by the compression device placed at a height of 4.5 cm from the patient's breast being imaged. Then, the multimeter was placed into the lower surface of the compression device. With the compression device in place, the radiation output was measured at various kVp ranging from 25 to 35 kVp by keeping 5 and 10 mAs. The average of mR/mAs (mGy/mAs) was calculated (X) and its consistency at each kVp station was checked by evaluating the coefficient of variation (COV) using the equation 2. The results are shown in [Table 4]. n - Total number of samples. Multimeter was placed on the center of the bucky at 65 cm FDD, and operating parameters were selected ranging from 25 to 35 kVp at constant 5 and 10 mAs setting in Mo/Mo (T/F) combination. 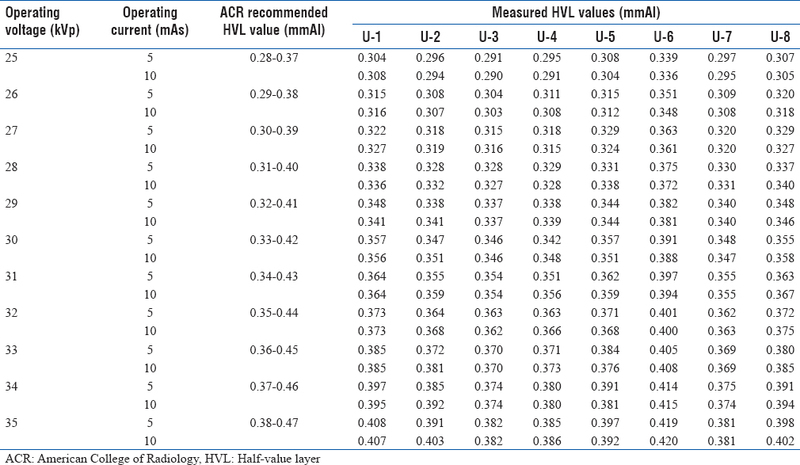 In each exposure, the HVL value was noted and compared with its corresponding HVL range, which is calculated using the formula provided by the American College of Radiology (ACR) as given in equation 3., The results are shown in [Table 5]. where C = 0.12 mm Al for Mo/Mo. The compression paddle is used to vary the breast thickness and in turn to reduce the breast dose. Hence, it is necessary to check the compression pattern of the device to avoid discomfort to the patient. To do so, a flat conventional weighing scale was placed on the bucky and the X-ray tube was fixed at a craniocaudal view (beam enters at the head side end of the part being examined and exits at the legend). Then, the compression paddle was pushed at a maximum level toward the bucky (loaded with cassette). At that time, the magnitude of weight in kilogram (kg) was noted in each mammography unit which was then converted into newtons (N) using the relationship 1 kg = 9.8066 newtons. The phantoms standardized by ACR for mammography image assessment are mammography accreditation phantom (CIRS Model 015 - Computerized Imaging Reference Systems, Inc., Norfolk, VA, USA) and single exposure high contrast resolution phantom (CIRS Model 016A, USA). These phantoms were used to assess the quality of mammography image. The mammography accreditation phantom resembles a 4.5 cm compressed breast of average glandular/adipose composition. 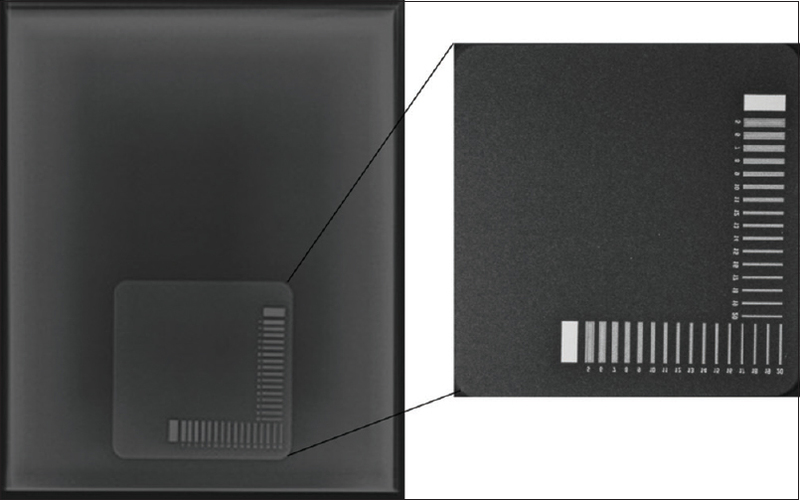 It is made up of 7 mm wax insert on the surface, a 3.4 cm thick acrylic base, and a 3 mm thick cover. 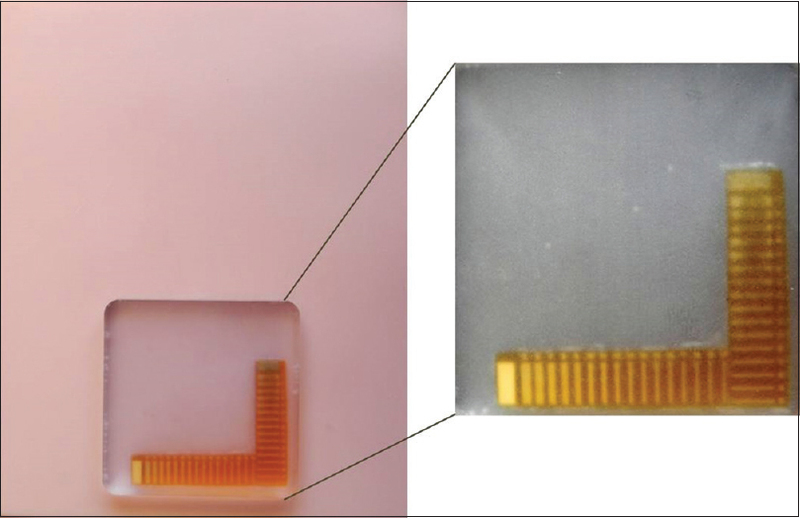 The wax insert consists of many objects such as nylon fibers, speck groups, and masses of different size and thickness which is used to assess image quality to detect fiber-like structures, microcalcifications, and tumors, respectively. 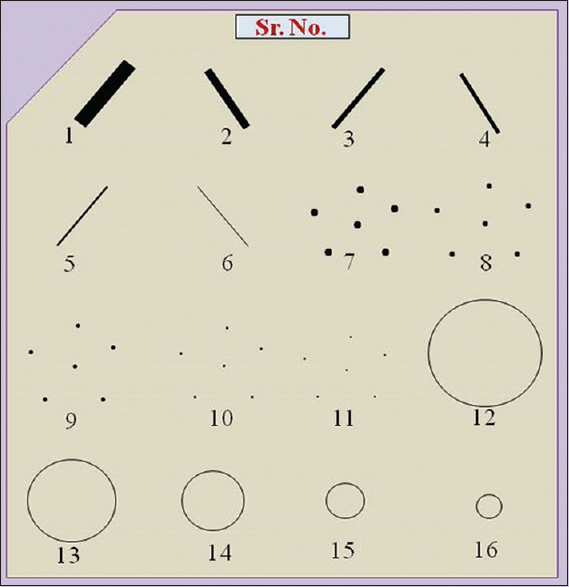 The schematic representation of the wax insert in the mammography accreditation phantom is shown in [Figure 1] and the sizes of objects in the wax insert are given in [Table 6]. To take measurements, the phantom was centered laterally on the image receptor so that the chest wall edge of the phantom can be aligned with the chest wall edge of the image receptor as shown in [Figure 2] and all the steps prescribed in the manual were followed as given below. The film was developed and analyzed to assess image quality. The single exposure high contrast resolution phantom which incorporates two 17.5 μ thick gold-nickel alloy bar patterns as shown in [Figure 2] was used to analyze the resolution of the image. These bar patterns are positioned at 90° to allow the assessment of resolution perpendicular and parallel to anode–cathode axis in just one exposure. The targets have 17 segments from 5 line pairs/millimeter (lp/mm) to 20 lp/mm and are equivalent to 25 μ of lead or 2.6 mm of aluminum at 20 keV. The patterns are permanently embedded in a thin acrylic sheet. It enables consistent, reproducible positioning at 4.5 cm above the breast support plate and 1 cm from the chest wall, centered laterally as recommended by the ACR. The phantom was placed at the desired height on the bucky and in such a way to keep the pattern within 1 cm of the chest wall edge of the image receptor. Then, the operating parameters were set as same as mammography accreditation phantom procedure, and the film was exposed. It is mandatory to measure leakage radiation around the medical diagnostic X-ray equipment tube housing to assure safety in accordance with the AERB safety code on diagnostic X-ray equipment and installations. X-ray tube housing shall be so constructed that leakage radiation averaged over an area of 10 cm 2, with no linear dimension >5 cm and located at 5 cm from any point on the external surface of X-ray tube housing, shall not exceed 0.02 mGy in 1 h. Based on this protocol, the leakage radiation in different direction of the X-ray tube such as anode side, cathode side, front, back, and top at 20 cm distance from the focal spot which corresponds to 5 cm from X-ray tube housing for a heavy exposure of 30 kVp and 100 mAs were measured using a pressurized μR ion chamber survey meter (451P-RYR, Fluke Biomedical). Radiation survey was conducted using the same pressurized μR ion chamber survey meter in different locations around the mammography room as given below when a 5 cm × 5 cm × 5 cm water phantom was placed on the bucky to achieve a full scatter condition, and it was exposed to 35 kVp and 100 mAs. In unit 1, the ED, Wall A, Wall B, Wall C, Wall D, WA, DR, and CC were located at 2.50, 1.87, 2.00, 2.13, 1.80, 1.90, 1.72, and 0.87 meters (m), respectively, from the X-ray tube. Similarly, in unit 2, these points of measurement are located at 2.38, 1.85, 1.80, 2.51, 1.80, 2.25, 1.80, and 0.93 m, respectively, in unit 3, 1.52, 0.80, 1.93, 1.20, 1.47, 2.00, 1.34, and 0.69 m, respectively, in unit 4, 1.72, 0.78, 1.45, 2.52, 1.55, 1.95, 1.13, and 0.87 m, respectively, in unit 5, 2.50, 1.20, 2.30, 2.18, 2.00, 3.25, 1.87, and 1.20 m, respectively, in unit 6, 1.62, 2.21, 1.83, 1.55, 2.50, 2.67, 1.80, and 1.35 m, respectively, in unit 7, 2.12, 2.37, 2.30, 3.15, 1.87, 2.50, 2.00, and 1.30 m, respectively, and in unit 8, 2.82, 1.25, 1.00, 2.75, 1.38, 3.00, 1.30, and 1.12 m, respectively. In the mammography unit, X-ray tube usage is important for the shielding design. The workload is a measure of the operational time or the amount of use of the X-ray equipment. A workload distribution indicates the workload across a range of operating voltages. Further, the work load was calculated using the equation 4. The stereotactic needle biopsy phantom (Model No. L-013) of thickness 4.5 cm was placed on the cassette holder and a portable MOSFET dosimeter (TN-RD-91, Best Medical Canada, Canada) S1 (TN-502RD-H) probe were placed on the phantom at various locations. The probe S1 was placed on the top of the phantom to measure the entrance surface air kerma (ESAK) as shown in [Figure 3]a. Likewise, measurements were taken thrice at various points as shown in [Figure 3]b for 28 kVp tube voltage and 90 mAs current. 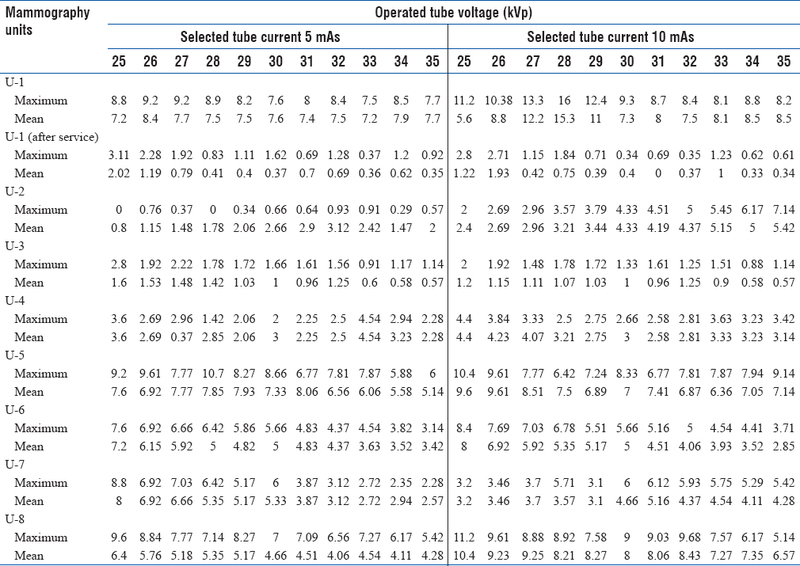 The unit 5 was selected for the AGD measurement study as it showed maximum output at low tube voltage out of 8 units as shown in [Table 4]. 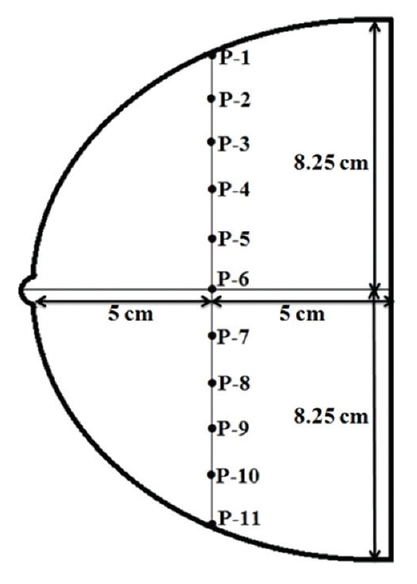 The AGD was measured using a Model No L-013 type stereotactic needle biopsy phantom in unit 5 by measuring the ESAK in 11 positions as shown in [Figure 3]b and also by knowing the ESAK to AGD conversion factor value of 0.187 at 28 kVp for Mo/Mo combination using the following equation 5. XESAK - Entrance skin air kerma in mGy. As given in [Table 2], the possible mechanical tests were carried out and it was found that all the mammography machines satisfied the basic requirements such as mechanical characteristics, working conditions of indicators in control panel, and tube housing indicators. From this, it was known that all the chosen machines were suitable for further QA. If otherwise, the unsatisfied machines need to be serviced instead of proceeding further. The percentage of variations in kVp accuracy calculated using the equation 1 for those eight mammography units at various kVp at 5 and 10 mAs are given in [Table 3]. From [Table 3], it is observed that the deviation in measured kVp reaches maximum value of 13.3%, 7.14%, 2.8%, 4.54%, 10.7%, 8.4%, 8.8%, and 11.2% for unit 1–8, respectively. As per AAPM guidelines, the acceptable limit of the percentage of variation in kVp accuracy is ± 5% and hence only the units 3 and 4 passed the kVp accuracy test. However, the percentage of variation in kVp accuracy is beyond the limit in units 1, 5, and 8 at all kVp and mAs settings. In unit 2, the percentage of deviation was within the limits at all kVp at 5 mAs, but it increased gradually and went beyond the limits at higher kVp at 10 mAs. In unit 6, the percentage of variation decreased gradually as the kVp increased at both 5 and 10 mAs settings. In unit 7, the percentage of variation decreased gradually as the kVp increased at 5 mAs settings, but it was reversed at 10 mAs. This variation may be due to the problem in the power supply connected to the X-ray tube housing and also rely on the switches on the control panel. 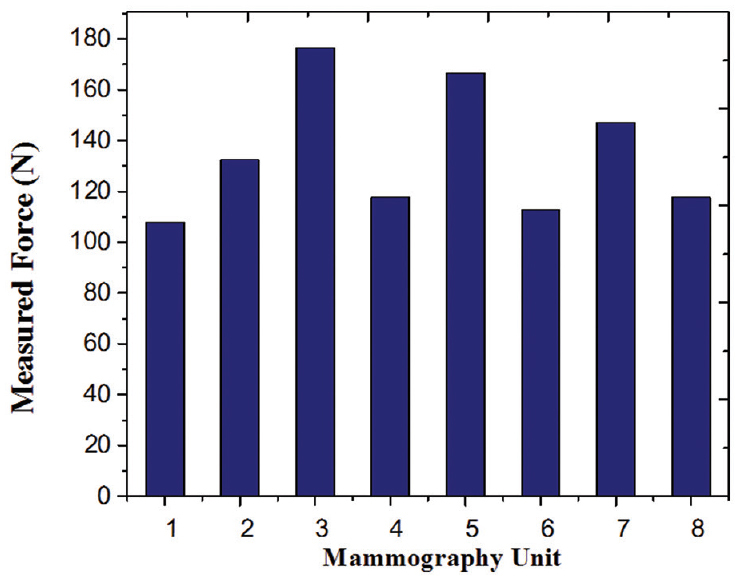 Out of eight mammography units, unit 1 showed the maximum deviation in kVp accuracy. This problem was solved immediately with the assistance of service engineer and radiological safety officer. The COV in output measurements calculated using equation 2 for those eight mammography units at various kVp at 5 and 10 mAs are given in [Table 4]. As per the AAPM protocol, the acceptable limit of the COV in output should be <0.05. The failing percentages in the eight machines were 0%, 18.2%, 18.2%, 13.6%, 40.9%, 13.6%, 4.5%, and 13.6% respectively. Other than the U-2, U-3 and U-5, all other units had failing percentages <15%. Nearly 96.3% of the failing COV is happening below the 30 kVp with more failing percentage in the low kVp. All COV for >30 kVp were passing except for the unit 5 at 31 kVp. Based on these data, it is observed that the COV tolerance higher at low tube voltage irrespective of tube current in most of the units. The mammography compression paddle was calibrated in the eight mammography units and the results are shown in [Figure 4]. From the figure, it is noted that the measured forces in units 1–8 are 107.87, 132.39, 176.52, 117.68, 166.71, 112.77, 147.1, and 117.68 N, respectively, which satisfies the AERB and AAPM recommended tolerance limit of 111–200 newtons. It is observed that the measured force is not the same in all the mammography units. If the measured force is less, the machine requires lesser force to compress the breast. Hence, the units 1, 4, 6, and 8 required lesser force to compress the breast, but units 3, 5, and 7 required more force for the same. To perform image quality assessment, the film was exposed in the presence of the mammography accreditation phantom at operating parameter 26 kVp and 50 mAs for Mo/Mo combination which is shown in [Figure 5]. The corresponding visibility details and scores obtained for various mammography units are given in [Table 7]. In accordance with the ACR guidelines, each mammography unit should show at least ten objects such as four in fiber, three in specks, and three in mass to pass the image quality when the AGD is 3 mGy or less. From [Table 7], it can be observed that units 2 and 4 were not satisfying ACR requirement of fiber visibility; other than these two units, the remaining units can give good quality images as they show 10–15 objects. Out of these 8 units, unit 3 gave the best image as it showed 15 objects out of 16. 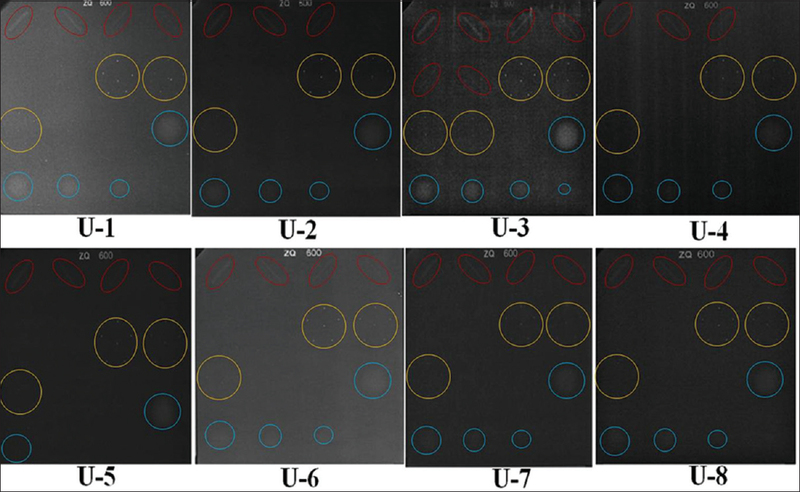 To measure the spatial resolution of the image, the film was exposed in the presence of the high contrast resolution pattern at the same operating parameter 26 kVp and 50 mAs for Mo/Mo combination in a plane 4.5 cm above the image receptor, and the same exposed film of unit 3 is shown in [Figure 6]. From [Figure 6], it is possible to clearly visualize 15 lp/mm for bars parallel to the anode–cathode direction and 13 lp/mm for bars perpendicular to the anode–cathode direction. The ACR recommended that the limiting resolution (for a high-contrast pattern) in a plane 4.5 cm above the image receptor, due to geometric factors, should not be <13 lp/mm for bars parallel to the anode–cathode axis of the X-ray tube and 11 lp/mm in the perpendicular direction. Hence, these results satisfied the ACR guidelines as well. The leakage radiation dose was measured as per the AERB protocol  around the X-ray tube housing in all mammography units at different directions such as top, back, front, right, and left side of the X-ray tube at a distance of 20 cm from the focal spot which corresponds to 5 cm from external surface of X-ray tube housing. From [Figure 7], it can be observed that unit 5 and 7 have higher leakage radiation beyond the AERB prescribed limit of 0.02 mGy in any 1 h. This was due to improper maintenance of X-ray tube shield and also failure in conducting QA program periodically. The dose reached a maximum value of 0.0211 mGy at the right side of the X-ray tube in unit 5. Similarly, in unit 7, maximum doses were measured as 0.0218 (U-7), 0.0201 (U-7), and 0.0207 mGy (U-7) at left, front, and top sides, respectively. In units 1–4, 6, and 8, the maximum doses observed were 0.0022 (U-1), 0.0031 (U-2), 0.0055 (U-3), 0.0069 (U-4), 0.0092 (U-6), and 0.0055 mGy (U-8) at right, left, right, right, right, and back sides, respectively, which is within the acceptable level. It was also observed that a minimal dose was obtained at the front side (Wall C direction) of the X-ray tube in all mammography units except U-7 due to the presence of a lead glass which is attached to the gantry near the collimator. The radiation survey was conducted in eight mammography units, and the variation in dose at different locations such as ED, Wall A, Wall B, Wall C, Wall D, WA, DR, and CC of the mammography unit layout is plotted in [Figure 8]. From [Figure 8], it is observed that the dose reached a maximum of 186 μR/h at ED in unit 3. This leakage was the result of a small crack in the ED which is at closer distance when compared to other units. In the CC, the maximum dose of 157 μR/h was measured in unit 1. Similarly, the maximum dose of 83 (U-4), 74 (U-8), 65 (U-8), 71 (U-4), 85 (U-1), and 143 μR/h (U-4) were measured in wall A, Wall B, Wall C, Wall D, WA, and DR, respectively. The doses measured from all these eight units at various locations were well within the recommended dose limits meant for any radiation worker concerned even though all the layouts are different in size. Work load data were obtained from eight mammography units; the results are 120 (U-1), 49.2 (U-2), 250 (U-3), 88.8 (U-4), 13.3 (U-5), 12.4 (U-6), 226.6 (U-7), and 35 mA min/week (U-8). From these results, we can see unit 3 and 7 have higher workloads out of the eight included in the study. 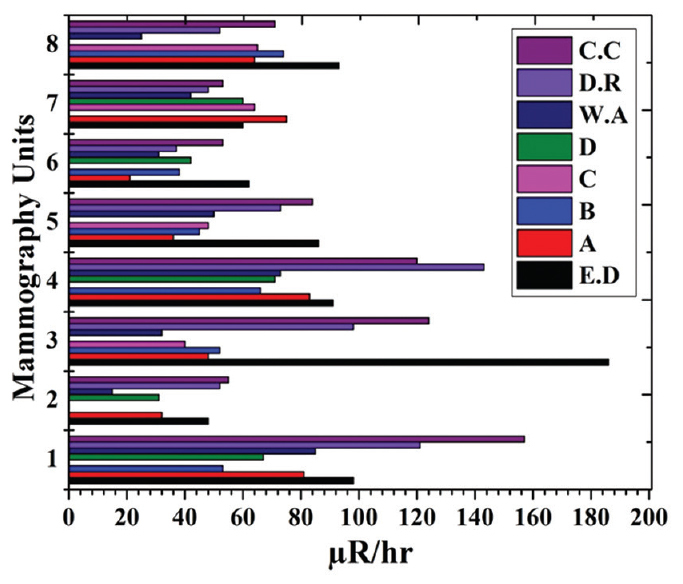 The data of calculated workload values are presented in this paper. It will be useful for clinical radiologists, radiographers, and medical physicists in shielding calculation for better radiation protection. The compressed stereotactic needle biopsy phantom was exposed at 28 kVp and 90 mAs and the corresponding entrance dose measurements were carried out at various locations of the phantom using MOSFET. 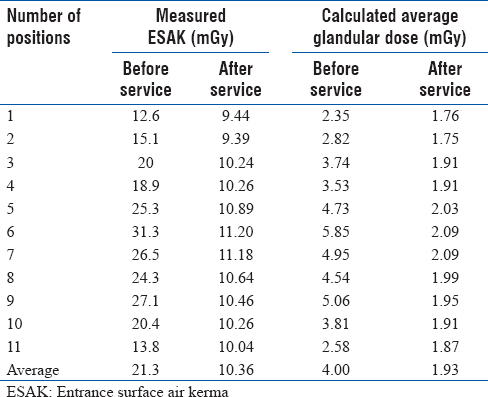 The captured image with the biopsy phantom is shown in [Figure 9], and the average value of ESAK measurements is given in [Table 8]. From [Table 8], it can be observed that the ESAK before service is in the range of 12.6–31.3 mGy with an average value of 21.3 mGy and the corresponding calculated AGD is in the range of 2.35–5.85 mGy with an average value of 4 mGy thus exceeding the European protocol tolerance value of 2.5 mGy for compressed breast and ACR protocol tolerance value of <3 mGy. However, after proper services in the same machine, the ESAK was measured in the range of 9.39–11.20 mGy with an average value of 10.36 mGy and the corresponding calculated AGD was in the range of 1.75–2.09 mGy with an average value of 1.93 mGy which is well within the European and ACR protocol acceptable limit in all the positions. This work had been borne out as a clinical project to understand the quality of the mammography units which are widely used for routine breast screening. The focus has been in the hospitals around our region to examine whether the units are maintained to meet the vendor specifications or the international stands. Our work revealed that the current QA programs followed by the clinics were inadequate to ensure safe use of the mammography units. It is clear that the medical care for women has been compromised which should be addressed immediately. We hypothesize that such inadequacies may not be just limited to our region only, but also all across the country. Even though this is a clinical project, our work had identified the inadequacies in these hospitals involved and immediately rectified them, bringing their QA program to international standards. Realizing the high expenses of QA instruments, our work also serves as a demonstration of providing clinical services to nearby hospitals. Rigorous implementation of QA for mammography units is essential. Current QA practices that are followed in clinics are inadequate and they do not comply with the international standards. Our clinical project has brought hospitals in our region to international standard by addressing the inadequacies in accordance to the AAPM and AERB protocols. This project also demonstrated a feasibility of shared cost of the expensive QA instruments if performed by a trusted entity for a small fee to bring the mammography units to international standards. We thank Dr. Ganesan Ramanathan, Mr. P. Venkatraman, and Ms. S. Sangeetha, for their support to improve the manuscript. The authors would like to acknowledge Science and Engineering Research Board, Department of Science and Technology, New Delhi, for providing financial support (Project Ref. No: SR/FTP/PS-171/2011) and all the hospitals/institutions in South India who supported this study. The authors would like to acknowledge Science and Engineering Research Board, Department of Science and Technology, New Delhi, for providing financial support (Project Ref. No: SR/FTP/PS-171/2011) and all the hospitals/institutions in South India who supported this study. Jafari M, Nakhaee N, Goudarzi R, Zehtab N, Barouni M. Participation of the women covered by family physicians in breast cancer screening program in kerman, Iran. Asian Pac J Cancer Prev 2015;16:4555-61. Ferlay J, Soerjomataram I, Ervik M, Dikshit R, Eser S, Mathers C, et al. GLOBOCAN 2012 v1.0, Cancer Incidence and Mortality Worldwide: IARC CancerBase No. 11. IARC; 2013. Available from: http://www.globocan.iarc.fr, accessedonday/month/year. [Last accessed on 2016 Jan 05]. Dubey AK, Gupta U, Jain S. Breast cancer statistics and prediction methodology: A systematic review and analysis. Asian Pac J Cancer Prev 2015;16:4237-45. AAPM Report No. 29. Diagnostic X-Ray Imaging; Equipment Requirements and Quality Control for Mammography. American Association of Physicists in Medicine; 1990. Kausha C. Breast mammography: Pictorial review. Indian J Pract Doct 2007; Available from http://www.indmedica.com/journals.php?journalid=3&issueid=94&articleid=1285&action=article [Last accessed on 2017 Aug 15]. Popli MB, Popli V, Bahl P, Solanki Y. Pictorial essay: Mammography of the male breast. Indian J Radiol Imaging 2009;19:278-81. Prasad G, Lewinski K. Quality control of mammography equipment according to the American college of radiology protocol. J Med Phys 2001;26:326-30. Ferlay J, Autier P, Boniol M, Heanue M, Colombet M, Boyle P, et al. Estimates of the cancer incidence and mortality in Europe in 2006. Ann Oncol 2007;18:581-92. AAPM Report No. 4. Basic Quality Control in Diagnostic Radiology. American Association of Physicists in Medicine; 1977. AERB Safety Code No. AERB/SC/MED-2 (Rev. 1). Safety Code for Medical Diagnostic X-Ray Equipment and Installations; 2001. Available from: http://www.aerb.gov.in/AERBPortal/pages/English/t/XRay/med-2.PDF. [Last accessed on 2016 Jan 10]. Kimme-Smith C, Bassett LW, Gold RH, Fox SA, Solberg T. Testing mammography equipment: Evolution over a 4-year period. Med Phys 1992;19:1491-5. Agarwal G, Ramakant P, Forgach ER, Rendón JC, Chaparro JM, Basurto CS, et al. Breast cancer care in developing countries. World J Surg 2009;33:2069-76. Sonawane AU, Singh M, Sunil Kumar JV, Kulkarni A, Shirva VK, Pradhan AS, et al. Radiological safety status and quality assurance audit of medical X-ray diagnostic installations in India. J Med Phys 2010;35:229-34. Tung CJ, Lin MT, Hsu FY, Lee JH, Chu CH, Tsai HY. Half-value layer determination using thermoluminescent dosimeters for digital mammography. Radiat Meas 2010;45:729-32. Pisano ED, Hendrick RE, Yaffe MJ, Baum JK, Acharyya S, Cormack JB, et al. Diagnostic accuracy of digital versus film mammography: Exploratory analysis of selected population subgroups in DMIST. Radiology 2008;246:376-83. Toroi P, Könönen N, Timonen M, Kortesniemi M. Aspects of forward scattering from the compression paddle in the dosimetry of mammography. Radiat Prot Dosimetry 2013;154:439-45. AAPM Report No. 14. Performance Specifications and Acceptance Testing for X-Ray Generators and Automatic Exposure Control Devices. American Association of Physicists in Medicine; 1985. Uchiyama M. The experience of mammography based on the memoirs of examinees. Health 2014;6:1310-4. Radiation Protection and Quality Standards in Mammography Safety Procedures for the Installation, Use and Control of Mammographic X-ray Equipment Safety Code 36. Health Canada; October, 2013. Caldwell CB, Fishell EK, Jong RA, Weiser WJ, Yaffe MJ. Evaluation of mammographic image quality: Pilot study comparing five methods. AJR Am J Roentgenol 1992;159:295-301. 21. ACR. Mammography- Quality Control Manual. VA 20191, USA. American College of Radiology; 1999. Boone JM. 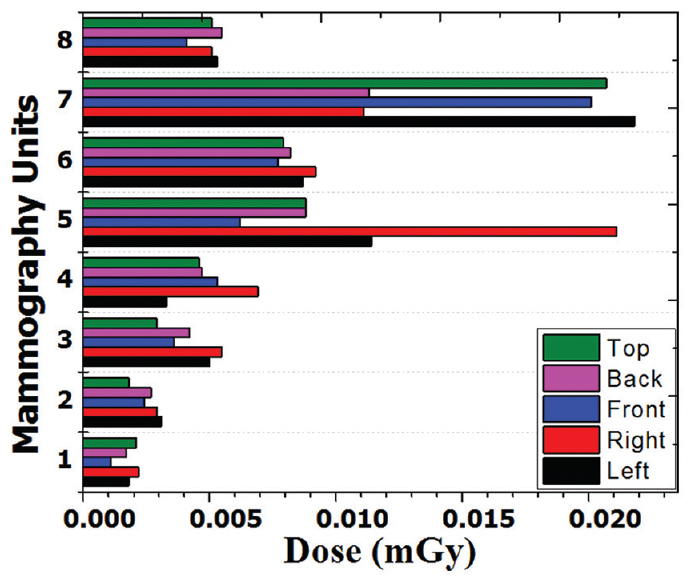 Glandular breast dose for monoenergetic and high-energy X-ray beams: Monte carlo assessment. Radiology 1999;213:23-37. Villar VC, Seta MH, de Andrade CL, Delamarque EV, de Azevedo AC. Evolution of mammographic image quality in the state of Rio de Janeiro. Radiol Bras 2015;48:86-92.
International Basic Safety Standards for Protection against Ionizing Radiation and for the Safety of Radiation Sources. Safety Series No. 115. Vienna: IAEA; 1996.